it looked for something other. Federico Garcia Lorca was one of the most important Spanish poets of the twentieth century. Born in 1898 in Fuente Vaqueros, was fortunate in his early years to be influenced by his mother, a gifted pianist from whom he absorbed the rhythm of music and words. As a teen, he wrote and performed readings of his poetry at local cafes. He studied law and philosophy at the University of Granada, fields he abandoned as he explored his love of the theater, art and literature. In 1918, he published his first collection of prose poems that were inspired by a trip to Castile. In 1919, he left the Granada region and moved to Madrid where he left the university and spent the next 15 years devoted to his art, concentrating on organizing theater performances, poetry readings and researching and collecting folksongs. In 1920, he wrote a scandalous play, El Maleficio de la mariposa along with Libro de poemas, a compilation of poetry rooted in Spanish folklore. His work was rich in Flamenco and Gypsy culture themes. During this part of his life, Lorca was introduced to surrealism after becoming part of a group of artists known as Generación del 27, which included Salvador Dalí, for whom Lorca felt a passionate bond, and Luis Buñuel. In 1928, Lorca achieved fame with his book of verse, Romancero Gitano, “The Gypsy Ballads”). Romancero Gitano was reprinted seven times during Lorca’s lifetime and earned him the unofficial title of the “Gypsy poet.” Lorca disliked this label and worked to dispel what he considered a pall over his work. Lorca moved to New York in 1929, discovered African-American spirituals in Harlem and immersed himself into the culture. It reminded him of the “deep songs” that he loved in his homeland. splashing in the putrid waters. for spikenards of drafted anguish. penetrate like drills and devour abandoned children. in mindless games, in fruitless labors. in the impudent challenge of rootless science. as if they had just escaped a shipwreck of blood. Lorca returned to Spain in 1930 to aid in the newly established “La Barracda” traveling theater company. In 1936, he was arrested by Franquist soldiers at the beginning of the Civil War. He was jailed for a few days, then taken to visit is brother-in-law, the former Socialist mayor of Granada, although the poet did not know that his brother-in-law had been murdered and his body dragged through the streets several days before. When the soldiers arrived at the cemetary instead of his brother-in-law’s home, Garcia Lorca was forced from the car, bludgeoned with rifles and his body riddled with bullets. His books were publicly burned and banned from Franco’s Spain and citizens were forbidden to utter his name, ironic commands considering that Lorca became a martyr for his country and school children still sing his ballads today. No one knows for certain where Lorca’s remains were buried. Some accounts place his body in an unmarked grave along with a schoolmaster and two bullfighters but although such graves have been uncovered, his remains have not been located. I’m Beth Winter and I hope you enjoyed this poet spotlight of Federico Garcia Lorca. Most of his poetry has been translated from Spanish to English to allow for a wider audience. The three poems included here are only a small sampling of the gifts that Lorca left for us to experience. 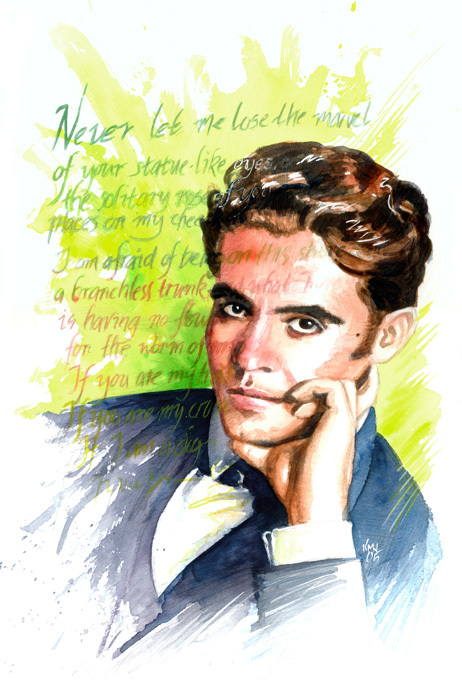 Image – Federico Garcia Lorca watercolor by Ken Meyer Jr. I write poetry, prose and anything else my itchy pen decides to scratch. I enjoyed your post very much! you haven’t lived till you’ve read Mark Statman’s recent translation of Lorca’s POET IN NEW YORK, published by Grove Press. Thanks! I have a new book on my wish list. Thanks, Beth–I was not familiar with this poet. What a story! I am learning so much by doing these posts. It is my pleasure, truly. Oddly enough I was just reading about him this afternoon. Struggling with my ghazal [ don’t we all ;-)}, I was trying to find one that Lorca had written, to get some tips. The one presented as such didn’t really look like the form I had in mind. Maybe they do it differently in Spain. It also said that he was not keen to be labeled as a gypsy poet: he said it was ‘just a theme’, nothing more. But I have always loved the Romancero gitano and come back to him time and again. I run into those parallels often in the poetry world. I don’t think they are coincidences, rather more that our minds follow similar trails. No, he wasn’t fond of the unofficial title. It was a theme of some of his work and like most unofficial titles, it stuck whether he preferred it or not. Thanks, Claudia. I’ve read several references to Lorca and Dali that state that their friendship was more complex than I put in the article. In fact, some sources believe that Lorca was killed and his writing banned due to his sexual preferences while others state that he was targeted because of his fame. We will never know for sure but in the end, they didn’t silence his work. My favorite poet. Thanks Beth. Thanks 🙂 Glad I could spotlight your favorite. Thank you Beth. The more time I spend in the pub, the more I learn! Beth, this was a fascinating article. I had known his name, but not much about him. Thank you for the details you provided & the poems of his that you shared. My pleasure, Mary. Glad you enjoyed it. Tragic! Ruthless … you painted that pretty good because I could see bayonets and bullets in the cemetery to an unknowing kind soul. Humankind can be wretched and beastly lacking heart and certainly soulless. Incredibly tragic and ruthless. Fortunately, his work remains and through it, he survives. Glad you enjoyed it. Thank you for this. I’ve read some Lorca, but not enough (is there ever enough?) and knew very little about his life–but you’ve expanded and enlightened. Wonderful. Truly a testament to the power of poetry and the influence of the poet. I learn so much while researching these articles that I look forward to this each month. When I research for these articles, I find so many resources that I lose track of time and dig deeper. So pleased you enjoyed it. During my most fluent Spanish speaking period I was able to read and understand Lorca’s and Neruda’s poetry and Gabriel Marques’ writing in Spanish – simply beautiful; the words roll off the tongue…now it would be more of a struggle, but have not lost too much. Thank you Beth. Thanx for the intro Beth. I have marked him to read more. As a learn a bit about poetry, I wonder about “translation”. If poetry is suppose to be about feel of the language — then translation will never suffice. Even a translation is the choice of the translator (having been a translator). And if poetry is suppose to be about content, the cultural differences and lack of historical knowledge blocks a lot without notes. So to me, it is sad that so much is lost because of language and culture. But I am glad some have tried so hard to help us touch it. Your post here is such a fine example. Thanx again for all your work! If I have to be shot, let me be “riddled”! Wow! You truly re-enlivened Lorca for me, and I have had him in my heart since I first studied theatre. There is a dance film–very poetic in its own way–of “Blood Wedding” by Carlos Saura ? It is a “Black Night” but not the one of memory in the last poem you include above.